Type 1 Diabetes after 55 - Nick Melhuish: How do doctors treat a blood sugar of 13 mmol/l (234 mg/dl)? They give intravenous glucose!!! How do doctors treat a blood sugar of 13 mmol/l (234 mg/dl)? They give intravenous glucose!!! Here is the local protocol for treatment of diabetics on insulin. 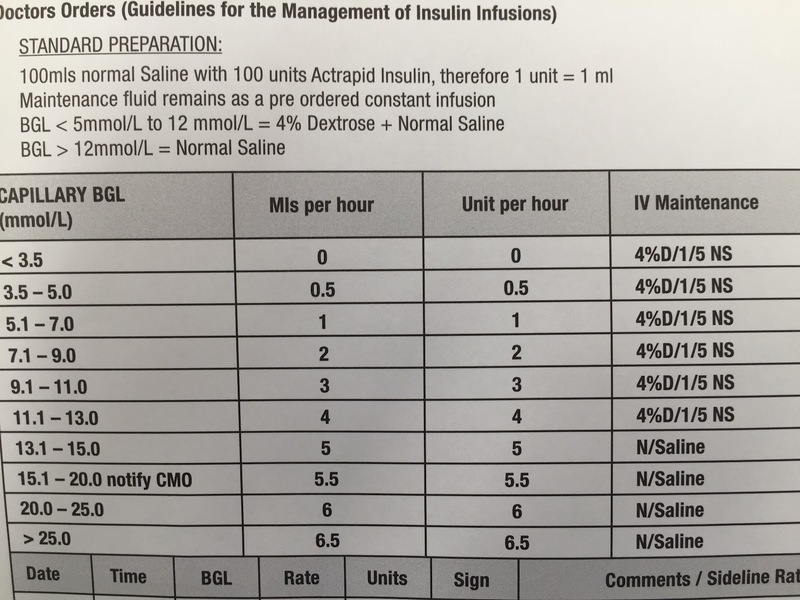 It dictates that a diabetic with a blood sugar of 13 (234) be given intravenous glucose, in the form of 4%dextrose/saline, usually at 120 ml/hr. That is 120 g of glucose per day for a standard hospital patient resting in bed. Many type 1s lead very active lives on much less carbohydrate per day than this, yet when they are confined to bed, doctors obsession with high carbs give them much more. They then treat the resulting hyperglycaemia with massive doses of insulin. The recommended starting rate equates to almost 100 Units per day, a massively supra-physiological level. Mammalian evolution has equipped injured animals to deal with immobilising injuries without exogenous glucose, yet doctors still feel the need to overdose patients on sugar, and insulin. Even if this results in a near normal blood sugar, problems are not infrequent. Insulin is one of the medicines most commonly listed in adverse drug reports. Any interruption of the dextrose delivery means that the patient is receiving a large amount of insulin unopposed. A low-insulin/low-glucose protocol would see hypoglycaemia developing much more slowly, and much more likely to be detected before harm was done. Dilutional errors in the preparation of infusions are also frequently reported. A high delivery rate magnifies the effect of these. 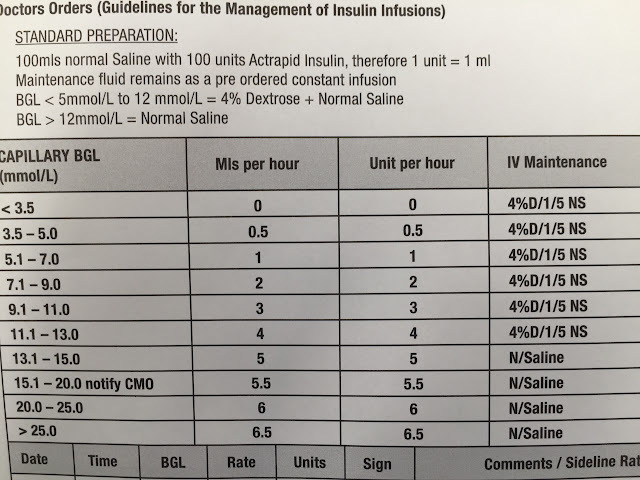 You will also note that the protocol contains 2 contradictory thresholds at which saline should be started. Have I previously mentioned doctors poor numeracy skills? Should I work standing up. The evidence says NO.